Slim Mints are crisp, chocolate-mint cookies topped with rich, dark chocolate. Scrumptious! Mix the dry ingredients in one bowl. Combine the egg, butter, sugar and peppermint essence in another bowl. Add the dry ingredients and mix well. You may need to knead the dough. Using waxed paper, roll the dough into a 1" diameter roll. Place the dough roll (s) in the refrigerator until hardened, several hours or overnight. 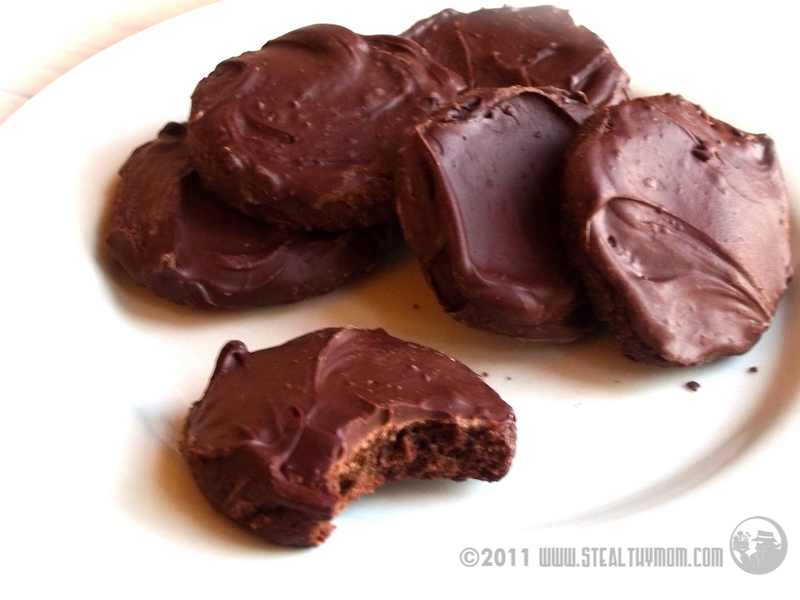 Remove from the refrigerator and slice into 1/4" thin coins. Slicing them thinner, if you can, will make them a bit crisper. Be sure to slice them as uniformly as possible to ensure even baking. Bake for 9-11 minutes at 370F. Allow the cookies to cool completely. Melt the chocolate chips and peppermint essence, mixing well. I use a microwave, thirty seconds at a time. Thickly ice each cookie with the melted chocolate, using a spatula. Place them on waxed paper and cool in the refrigerator.